It would have been hard for the San Francisco Police Department to pick a more congested area to stage their action. The Powell Street cable car turnaround (black circle) and pedestrian mall (black hash marks) is reputed to be the most heavily foot trafficked area in the United States outside of New York City. Hundreds of thousands of tourists and city visitors visit this spot annually. 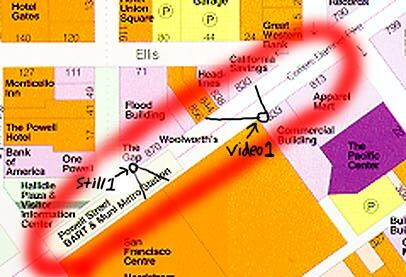 The police set up a road block at Fifth Street, the "west" end of the red circle. An eye witness reports police vehicles drove through the crosswalk at Market and Fifth and riot club-armed officers jumped out and started smashing the legs of cyclists in their path without warning or provocation. Note: the assaults took place throughout the entire length and breadth of Market between Fifth and Fourth Streets. The shots we have (still 1 and video 1) captured only a relatively tiny slice of the riot. Eye witnesses are filling in the gaps and we are in search of additional photos.